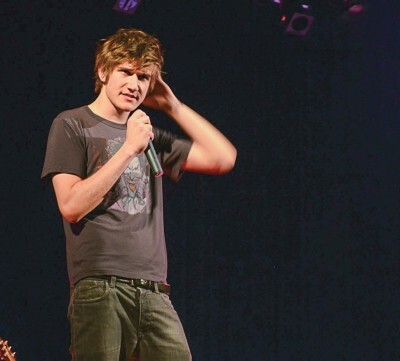 “You ain’t never seen a comedy show like this in your life,” rapped comedian Bo Burnham at the University of Calgary on Oct. 25. It’s an overflow show, after the one the night before sold out almost immediately. We have seen a comedy show like this, but only by Burnham himself in his last comedy tour called “what.” available on YouTube. Burnham is a 25-year-old white kid with long, lanky limbs and a stereotypical teenage boy haircut. He’s also hilarious. Burnham’s breed of comedy crosses several mediums. He doesn’t hold back and is self-deprecating. Burnham’s stage persona is either hyper self-aware, or narcissistic and self-absorbed. Both personas make the audience reflect on themselves. You’d think that Burnham’s audience would be kids like him, but the audience on Oct. 25 also included people old enough to be his parents. One thing Burnham never does is waste a comedic opportunity. He roasted the fact that we were the overflow crowd, he roasted his own set and made several jokes about his fog cannons. A theme that came up several times was “first world problems.” Burnham is very aware that he is a young, prosperous, white kid who make jokes and complains a bit for a living. He spoke about how quality comedy comes from when you draw from your own experience, but as a young, white-privileged man, that can be difficult. He then launched into a song about Pringles cans being too small for his hands. Burnham’s onstage persona is either aggressively arrogant or so self-aware it’s pathetic, both exaggerations of aspects of his own personality. He also likes to play with audience expectation. In one bit, he walks from the stand-up mic to the piano and then loops back telling the audience not to try to anticipate what he’s about to do. By the one hour and 20 minute mark, I was getting impatient. The deep stuff had to be coming soon. It manifested most in the last song of his set. Where in “what.” the introspective moments focussed on why Burnham does comedy, “Make Happy’s” final song is devoted to his relationship with the audience. He talks about the struggle to stay true to himself and also give the fans what they want. This was emphasized by a few other moments from earlier in the show, including Burnham turning on the house lights and lowering the barrier between audience and performer. Uncommon for most comedy shows, Burnham got a standing ovation after his set, which only stopped when he came back out, riffed a little, and performed one of his old hits, “Oh Bo.” Burnham’s audience was incredibly supportive, helped by how much he interacted with them during the show. He played a song from his last show, “From the Perspective of God,” and the diehard fans in the audience attempted to sing along, even though the song doesn’t lend well to karaoke. Burnham’s success came young, and grew quickly over a short time. “Make Happy” showed that he hasn’t fallen victim to the shooting star phenomenon. Although he has a signature format, the material still feels fresh, and he can still surprise the fans who’ve followed him ever since he first posted the song “My Whole Family” in 2006. Burnham was only 16, and just two years later would release his first musical comedy album on Comedy Central’s record label. After also injecting his comedy into a book of poetry (Egghead) and creating a short-lived TV show playing a fictionalized version of himself (Zach Stone Is Gonna Be Famous), I can’t wait to see what he comes up with next.